When one feels they have been truly heard, there is a deep feeling of being understood. Hearing aids styles are recommended based on the nature of your hearing loss, the size of your ear canal and your level of finger dexterity. A Hearing Care Professional will help you choose the one best suited to your hearing needs. As a Beltone Authorized Hearing Aid Dealer, we can introduce you to world-class hearing aid products. About the size of a raspberry, Invisible-in-the-Canal (IIC) hearing aids are hidden from view – yet provide a clear and natural listening experience. An impression is taken of your ear canal and converted into a 3-D computerized rendering. Each component is “virtually” positioned to create the tiniest finished product possible. Your hearing aid is then built and delicately sculpted to match the exact contours of your ear canal – for a “made-for-you” shape. The ingenious construction takes advantage of the ear’s anatomy to provide the nearest-to-natural sound quality, and a nearly invisible appearance. Placing the microphone in the curved portion of your outer ear protects it from wind noise for superior sound. The main body of this premium hearing aid hides in your ear canal and is custom-shaped to your ear for incredible comfort. The microphone is hidden in the curved groove of your outer ear. 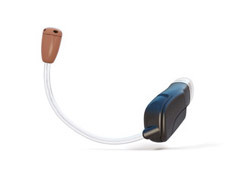 Receiver-in-Ear (RIE) hearing aids are the most popular behind-the-ear style on the market. 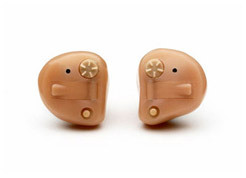 They address nearly all degrees of hearing loss, offering exceptionally natural sound quality at a discrete size. 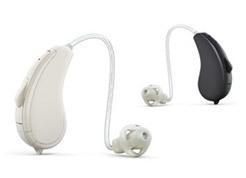 RIE style hearing aids can be used with custom-made or standard ear moulds, depending on amplification needs. A barely visible casing sits behind the ear, housing the electronics. A narrow transparent tube connects the receiver, which rests in your ear canal. 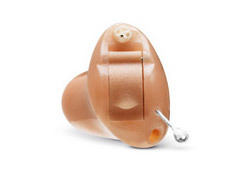 In-The-Ear style hearing devices fill the outer ear cavity (partially or completely). They are custom manufactured to fit securely, and be as aesthetically pleasing as possible. All components reside within a lightweight plastic shell, which is simple to insert and remove. Their bigger size accommodates a variety of feature options, including special controls that are easy to adjust. ITE hearing aids use larger batteries, which can power a bigger receiver. 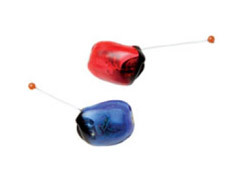 This makes them a superb choice for more serious hearing loss. Larger batteries also last longer and are easier to handle. A cosmetically appealing, mid-sized hearing aid. 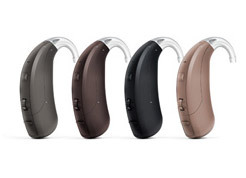 ITC hearing aids offer a secure fit, easy insertion and removal, and longer battery life. They work best for mild-to-moderate hearing loss. They’re custom fitted, and all components are encased in a lightweight plastic shell with push button controls. Also available in the popular Mini ITC style model. Those with mild-to-moderate hearing loss love CIC hearing aids because the surprisingly small inside-the-canal design provides improved hearing, with no one the wiser. It is custom-crafted from an ear canal impression, creating a perfectly tailored fit. This ensures maximum comfort and sound quality. Easy-to-wear and budget-friendly, BTE devices nestle comfortably behind the ear. 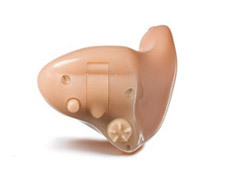 Ear moulds are lightweight and comfortable, making BTE hearing aids easy to wear all day. They assist the entire spectrum of hearing loss. A transparent tube connects the device to a custom-created ear mould worn in your ear canal. BTE style hearing aids can be used by just about everyone.